Looking for an exotic getaway on Europe’s doorstep? Then Morocco is where you need to be heading! A gateway to Northern Africa with stunning coastlines on both the North Atlantic Ocean and the Mediterranean Sea, Morocco offers it all and then some. From rugged coastlines, mountains and the mighty desert to ancient medinas, mazelike medieval quarters and bustling markets, you could spend weeks here drinking in the dizzying diversity and still not feel like you’ve scratched the surface. Full of Berber, Arabian and European cultural influences, a mixture that you won’t find anywhere else in the world, Morocco gives off a charm that will have you coming back for more. To experience the most out of Morocco, read on for our complete guide of travel tips, where to stay, what to eat, and what to do. Electricity Socket: 230V AC electricity. Power outlets are two-prong round sockets. To avoid the hassle of having to buy new adaptors for everywhere you go, we recommend picking up a Universal Travel Adaptor before you leave. Visa: Most travelers who want to visit Morocco can do so without applying for a visa if your trip will not exceed three months (90 days), however, it is essential that your passport is valid for the duration of the trip and for some nationals, 6 months after your trip ends (Canada and Australia). The countries that are eligible for visa exemption include the USA, the UK, Canada, Australia, and most EU countries. If you plan to stay longer than 90 days, a resident permit is required and can be issued by the police department of your place of residence in Morocco. Traveling in Morocco is generally safe for tourists, but as with any other North African country, the culture is very different from the West so it is good practice to be aware of these. The risk of crime is fairly similar to any other city, so be cautious in crowded areas and aware of your valuables as pick-pocketing and bag snatching can occur. A common issue in Morocco is con artists so beware of ‘Faux Guides.’ These are men who tend to target tourists, pretending to be guides or asking for your help with their English with the aim of getting you into their shop where they may pressure you to buy something. This is nothing to worry about as you can easily avoid this; never accept the ‘services’ of random people who approach you and avoid eye contact, give them a firm and strong “no” once and keep walking. We even experienced little kids telling you that that particular part of the medina is closed just so you can avail of their tour guiding services. As always, no matter how safe a country is, we always recommend getting travel insurance. We recommend going with World Nomads, due to the large number of sports and activities that they cover. It is completely safe to travel with children to Morocco as the culture is very family-orientated and contrary to popular belief, it is also safe to travel as a woman. Just make sure to dress modestly, adhere to local customs, and don’t take any comments or staring too personally. Morocco is predominantly a Muslim country so make sure you are somewhat conservative with your clothing choices. Language: There are a few dialects of Arabic that are widely spoken in Morocco, as well as Berber languages and even some French, German, and Spanish. English is gaining popularity among younger Moroccans, and in main touristy areas, it is widely spoken. However, making an effort with the local language goes a long way when traveling so grab a phrasebook and give it a try as much as you can! 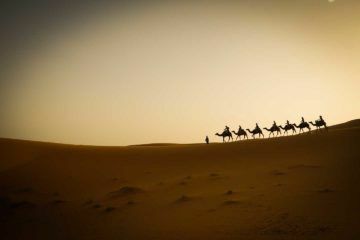 Transportation: The transport from one place to the next is fairly easy in Morocco. Busses and Trains are easily available and are actually quite efficient. We recommend downloading the Skyscanner App to check flights. For buses, you can check both Supra or CTM tours. 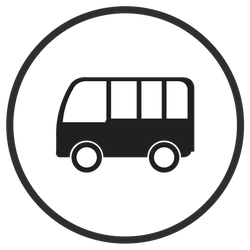 During peak season, buses tend to book out so make sure you reserve online a few days before you plan on traveling. Although the CTM website is predominantly in French, it can be easily read using Google Translate. It gets quite unbearably hot during a few months in Morocco, so the best time to visit is said to be in the Spring as you can reap the benefits of the Summer climate in the South and in the mountains, as well as on the Mediterranean and Atlantic coasts. 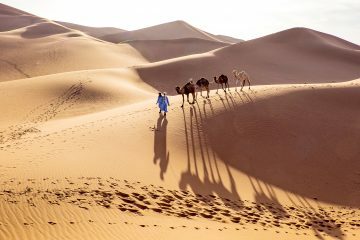 Low Season (May to Sep) – Summertime in Morocco is extremely hot with average highs hitting triple digits, yet in those three Summer months, tourists will flock here and room rates with skyrocket. In May and September, you will be able to find discounts in accommodation souqs. If you travel during this time, be mindful of the weather, drink plenty of water and follow the locals’ lead by staying in the shade from noon to 3 p.m. Shoulder Seasons (April & Oct) – With cooler weather, the shoulder months are great for exploring the main cities and avoiding the crowds, however, make sure to pack an umbrella just in case of unexpected showers in April. April sees temperatures to 70s to 80s while October will bring temperatures in the range of 40s to 90s. In these seasons, the landscape is lush and green, and in October, summer crowds wane and budget-friendlier room rates can be found. High Season (Nov-March) – Although the temperatures may reach highs of 60 and 70 in the day, expect it to plummet into the 40s come nightfall. The most popular season, tourists flock here for sport and Christmas events (did you know you can ski in Morroco?) Although it is less popular, there is something beautiful about driving through the Atlas mountains and seeing it covered with snow! In simple terms, all you need for Morocco is long shorts or trousers and t-shirts. Pack clothes that are modest, such as things that cover your shoulders and knees, and you won’t attract any unwanted attention. There are plenty of sarongs available for sale in Morocco so having one at hand is always a great way to respect their local traditions. Shopping is a past time in this country and there are hundres of stalls which you can buy from so don’t worry too much about packing loads of items. When packing for any season, we recommend taking layers (breathable t-shirts are amazing! ), as you can add or take away depending on the temperature! In the Summer season, pack additional essentials such as a sun hat and sunscreen, while in the Winter, bring those thicker socks, woolly hats, and a jacket. Probably one of the most well-known cities in all of Morocco, Marrakech needs no introduction (but we are going to give it one anyway). A magical place and former imperial city in Western Morocco, Marrakech is filled to the brim with colorful markets and souks and beautiful mosques, palaces, and gardens, all contained within towering medieval walls. 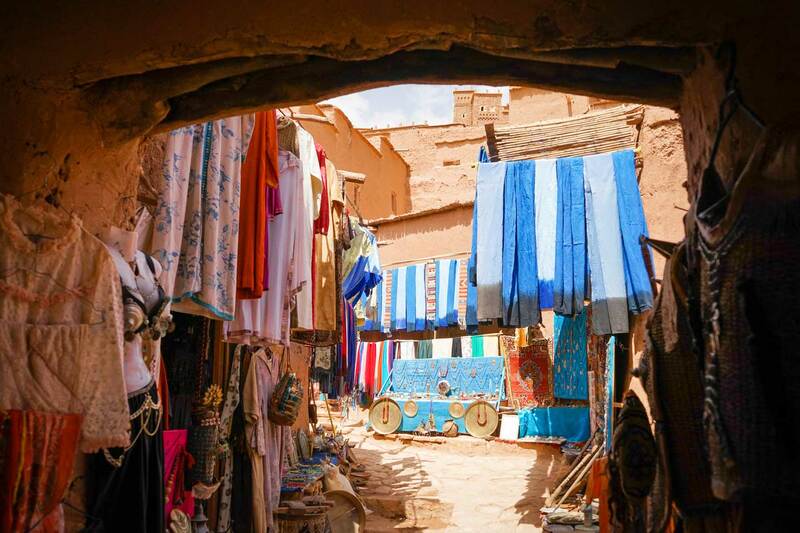 A mazelike city, you can spend hours here exploring all of the winding alleys, discovering the range of traditional textiles, ceramics, and jewelry in the markets, and drinking in the general bustling atmosphere of Moroccan life. With a stunning medina, traditional entertainment in its Djemaa el-Fna square and the lush Jardin Majorelle, this city really does offer you everything. While in the city, stay in the many beautiful riads which pepper the city. These palatial like hotels are the perfect location to get that perfect Instagram shot and are actually very affordable. 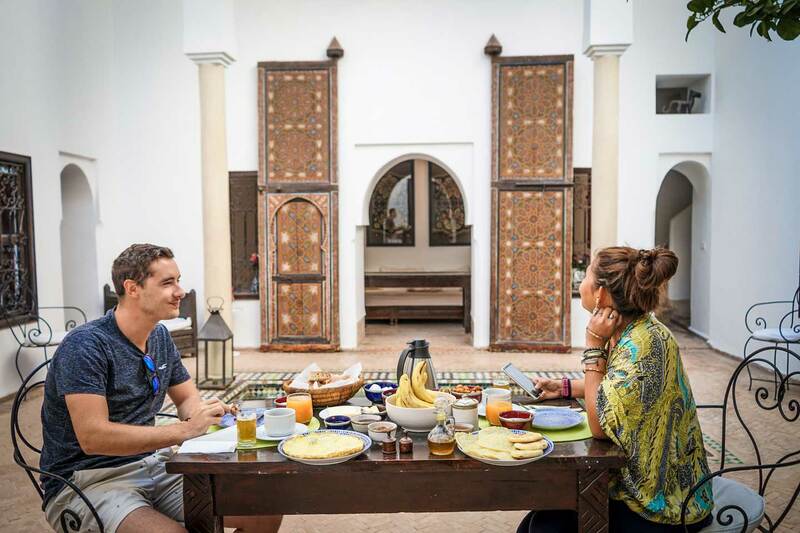 We stayed in Riad Porte Royale during our stay in the city and loved the affordable luxury that it provided. 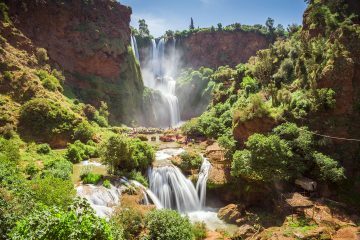 We love getting outdoors and immersed in nature, so we just had to recommend a visit to the majestic Ouzoud Waterfall in the Atlas Mountains. Located near the Moyen Atlas village of Tanaghmeilt in the province of Azilal, this site may be 150km northeast of Marrakech but it is definitely worth the trip. On the way to the falls, you can explore some quaint Berber Villages if you have time, but if you don’t. you’re going to want all the time you have to be spent admiring the waterfall. Feast your eyes on the tons of water that continuously tumble down the mountains and admire the gorgeous green surroundings while you bathe in its waters. 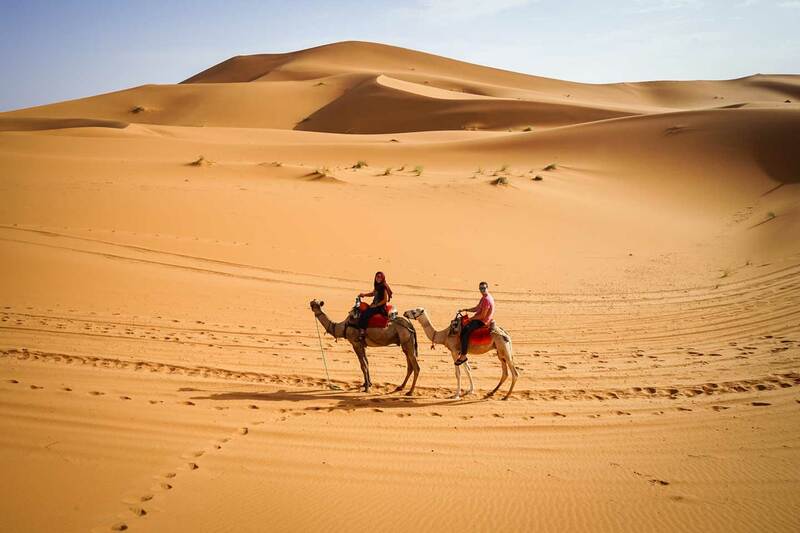 You haven’t completely traveled to Morocco if you don’t pay a visit to the desert, so head to Merzouga for a full tour. We’ve all seen the stunning pictures of the incredible Moroccan sand dunes complete with a warm orange glow and camels in the distance. If you haven’t, then take a look, it’s a pretty amazing sight! 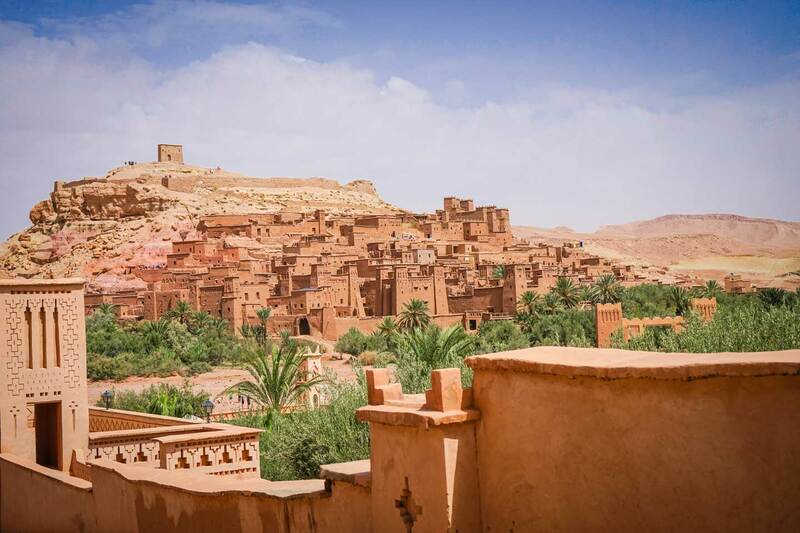 If you want to spend a night in the desert, riding a camel or hiking, and sleeping under the stars, visit the little village of Merzouga in the east and get yourself a guide. You can arrange this in Marrakech if you’d rather as it takes up to 10 hours to drive to this village at the Algerian borders. For 1 to 3 nights, you can spend your days exploring the extreme terrain finished off with a comfortable sleep in your luxury desert camp. We did a Morocco Desert tour from Fes to Marrakesh which included a night in the Sahara Desert and was one of the highlights of our two-week trip. 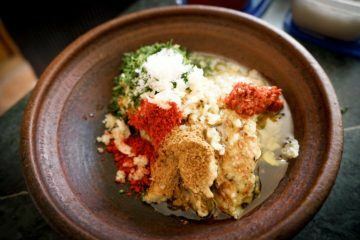 One of our best experiences was when we did a cooking class in Marrakesh! It gave us amazing insight into the cuisine and how much time it takes to prepare each dish from scratch. 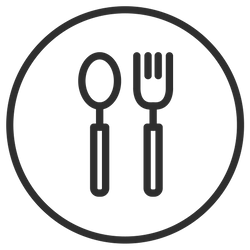 We did this particular Marrakesh Cooking Class in Cafe Clock but there are loads of other options which you can see below. If you haven’t seen the striking images of the iconic village of Chefchaouen, look them up now! This is one place that will win the hearts of many. 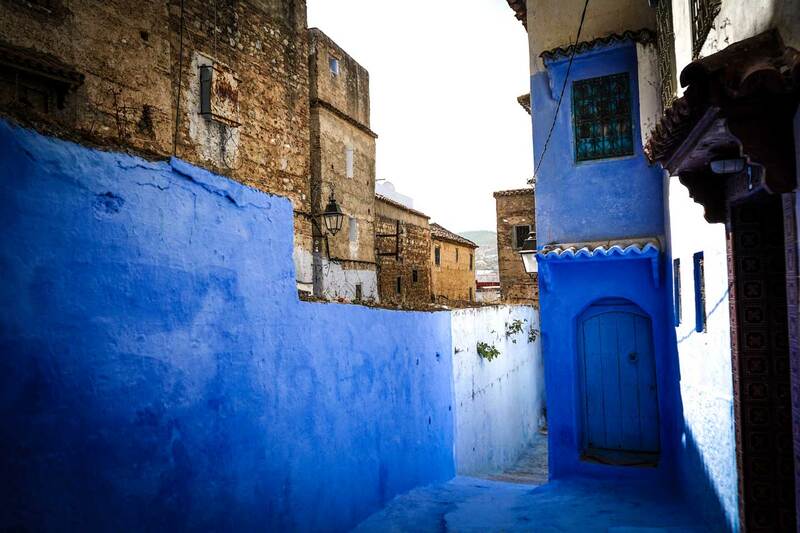 About 60km south of the city of Tangier, you will discover an old town completely awashed with blue. From floor to ceiling, every exterior surface is covered in blue which as well as amazing many a traveler, also has a strangely calming effect. A truly unique place to see, experience this relaxing feeling for yourself and discover one of Morroco’s most iconic sites! Although touristy, it is still worth visiting! We highly recommend doing the hike to the Spanish Mosque or chilling in the many riad rooftops. Morocco’s seventh largest city and capital, Rabat has been described as a little piece of heaven. A 12th-century royal fort perched on the Atlantic Ocean overlooking the water, this city is so much more than just the capital. Although often missed by travelers making their way through Morocco, Rabat completely charms the hearts of those that don’t. Full of impressive landmarks that speak to its Islamic and French-colonial heritage, such as the Kasbah des Oudaias, the Hassan Tower and the Royal Palace, this city is full of beauty as much as it is history. Complete with formal gardens, palm-lined boulevards, clean beaches, and a walled medina, Rabat is a refreshing alternative to escape the crowds of the other cities in Morocco. This stop has to be one of our favorite places in the country. Between the beautiful beach which was bustling with water sports activities and the laid back medina, we loved our time in Essaouira. Unlike Marrakesh or Fes, Essaouira is a small yet quaint market with laid-back vendors who don’t hassle you. There are also loads of fantastic seafood grill places along the port where you can get a platter of freshly grilled seafood for a fraction of the price compared to restaurants. It also has a cool fortress overlooking the water. If you’re a lover of UNESCO World Heritage Sites – because let’s face it, who isn’t? – then you can’t leave Morocco without paying a visit to Aït Benhaddou, a truly magnificent ighrem (fortified, walled village). 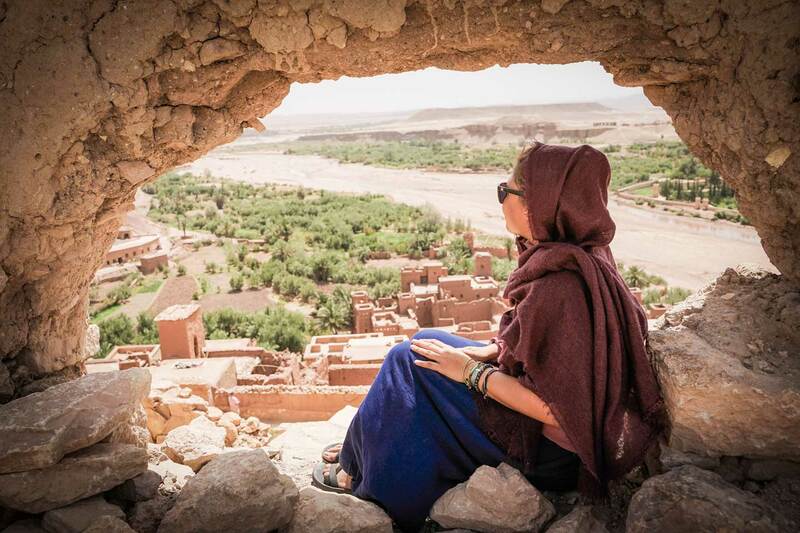 The sight alone of Aït Benhaddou is spectacular as the village appears to be carved with the mountain itself and it only gets better as you step through its walls. Once a stopping point for traders through the desert, you may recognize this great beauty from films such as Lawrence of Arabia, Jesus of Nazareth, and Gladiator. Make sure to arrive early to avoid the crowds and you can spend a few hours just exploring the red mudbrick village that seems to be frozen in time. Full of flavor, subtle spices and delicious combinations of Berber, Jewish, Arab, and French cultures, Moroccan cuisine can take you on a complete gastronomic rollercoaster. Completely unique to this country, it’s no surprise that this dynamic cuisine is considered among some of the best in the world. Cous Cous: Originally from Morocco, this fine wheat pasta (or ‘Seksu’) is typically served with meat or vegetable stew. Traditionally, this dish is rolled by hand and prepared on the Muslim holy day (Friday) and for special occasions, however, you will find it at most restaurants and cafes. Zaalouk: A common side dish and typically served with crusty bread, zaalouk is a smoked spread made with eggplants, tomatoes, garlic, olive oil, paprika, cumin, and a little chili powder. 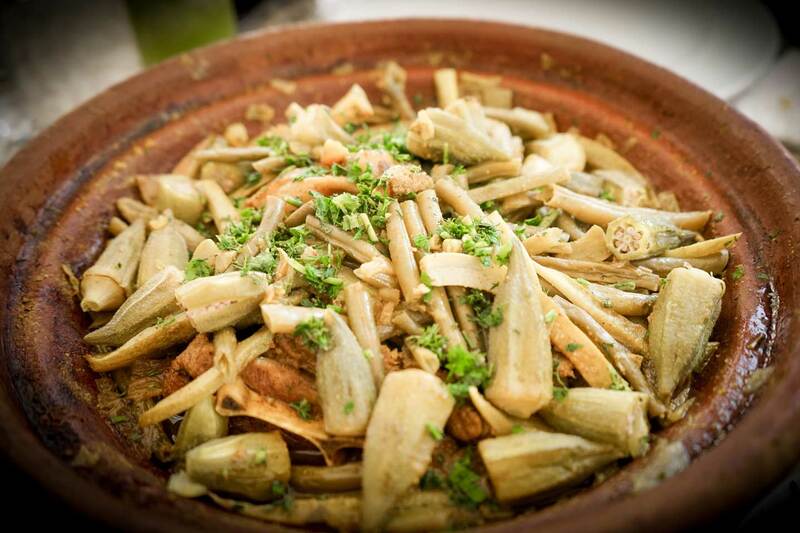 As Moroccan meals begin with at least seven cooked vegetable salads to scoop up with bread, you will find zaalouk pretty much everywhere with different variations of it. Harira: Put simply, harira soup is the Moroccan version of lentil soup (but it’s so much more than that!). Rich with tomatoes, lentils, chickpeas and lamb, and served with a sticky sweet pretzel called chebakkiya, this amazing creation is enjoyed as a starter or used during Ramadan to break the fast at sunset each day. Tanjiya: This slow-cooked beef or lamb is commonly eaten in Marrakesh. It is placed in a ceramic urn-shaped pot and is slow-cooked inside the hammams (steam baths) for hours at a time. The result? A melt in your mouth meal that is loaded with flavor. This is typically eaten with bread to soak up all the goodness. This is a must-try! Tagine: Even if you don’t know Moroccan cuisine, we’ve all seen that terracotta clay cooking pot with a conical lid and wondered what it was. It’s a tagine! Slow-cooked savory stews full of beef, lamb, chicken, or vegetables, you can find tagine anywhere in Morocco from cafes and restaurants to roadside stops, and all of them will be served with bread. There’s no shortage of options when it comes to choosing accommodation in Morocco whatever your budget. 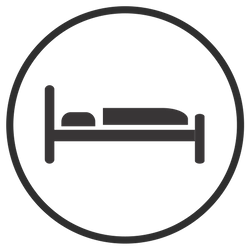 Hostels and hotels are cheap, good value, and easy to find, although it is worth noting that in August, there can be a shortage of places to stay, especially in major cities and resorts like Tangier, Fez, Marrakesh and Agadir. 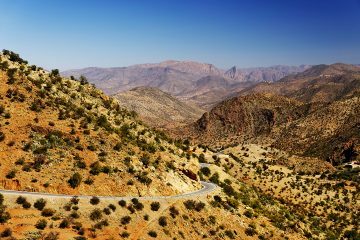 Whether you prefer hotels, AirBnBs, local guesthouses, or camping, you can find a wide range of budget options throughout Morocco. If you’re traveling in the peak seasons, we recommend checking sites like Booking.com, Agoda, or Hostel World and booking in advance so that you’re not left disappointed!